You want a high quality garage door that's durable, ecoenergetic, and that is weather-tight, naturally. At B & M Garage Door Inc, we know what you want and we have what you need. Quality customer service is one of the most important things at B & M Garage Door Inc. Our staff have many years of experience with garage door repairs in Brampton as well as garage door opener repair and preventive maintenance inspection. Fast and smooth installation is important. Our years of experience working with Garaga have provided our installers and technicians with the skill they need when it comes to offering quality installation quickly and easily. Your garage door is one of the most important elements of your home. You want it to be perfect, and you want it to improve the home's curb appeal. Garaga and B & M Garage Door Inc can ensure you are getting a door that will improve the aesthetic value of your home, and that will last for a number of years. You can use our Design Centre, which makes it easy to create a garage door that works for the design and style of your home, and that fits your particular tastes. 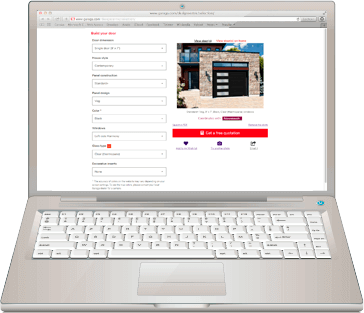 You can start by choosing a door model, and then choose the colour, along with door knockers and windows. It's easier than ever to get the garage door of your dreams. Try the Design Centre and see how easy and fun it is! Check out our expert advice on buying your garage door! It can be frustrating to try to choose a garage door with all of the options that are available. We understand how this feels! We have years of experience in the field of garage doors, and we're able to offer you help from experts who know more about choosing the right door than anyone else. Our employees are able to provide you with guidance when choosing a door that's in your budget and that conforms to your needs, as well as your stylistic sensibilities. We'll let you know about all of your options, we'll make sure you have quality insulation, and we'll let you see all of the great accessories that can help to make your door more functional and more attractive. Your garage door needs the best products and equipment, naturally. At B & M Garage Door Inc, we make sure to offer only the best products available. The products we provide are safe, durable, and efficient. The LiftMaster garage door opener is easily the top choice for openers, and we stand by its quality. LiftMaster garage door openers have a number of features that make them special. They are reliable and safe, making it possible to ensure the door opens smoothly and safely each time. It also ensures that the door closes properly. It's now even possible to control the door using a smartphone, tablet, or computer with just a tap of a button, even if you aren't at home. It's always a good idea to make sure your garage door is in proper working condition. It makes the garage a safer place, and it ensures that opening and closing the door is convenient and simple. 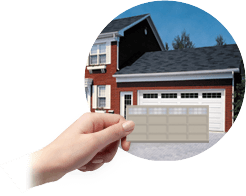 The garage door specialists at B & M Garage Door Inc in Brampton, ON understand the importance of checking the condition and reliability of your door. We offer an annual 10‑point maintenance program. With this program, the experts will provide a complete visual inspection of your door. In addition, we'll add lubrication and small adjustments if needed. This ensures you have more peace of mind when it comes to your garage door.